Bol'shoy lake to the north of Kirovsk, Kola peninsula, Murmansk Oblast. Topographic Map of Western Russia with the Ural mountains, the Ural River, and the Northern Caucasus mountain range, which by convention define the border between European Russia and Asian Russia. Russia, officially the Russian Federation (Rossiyskaya Federatsiya), is the world's largest country. It occupies a significant part of the northern portion of the Eurasian continent. 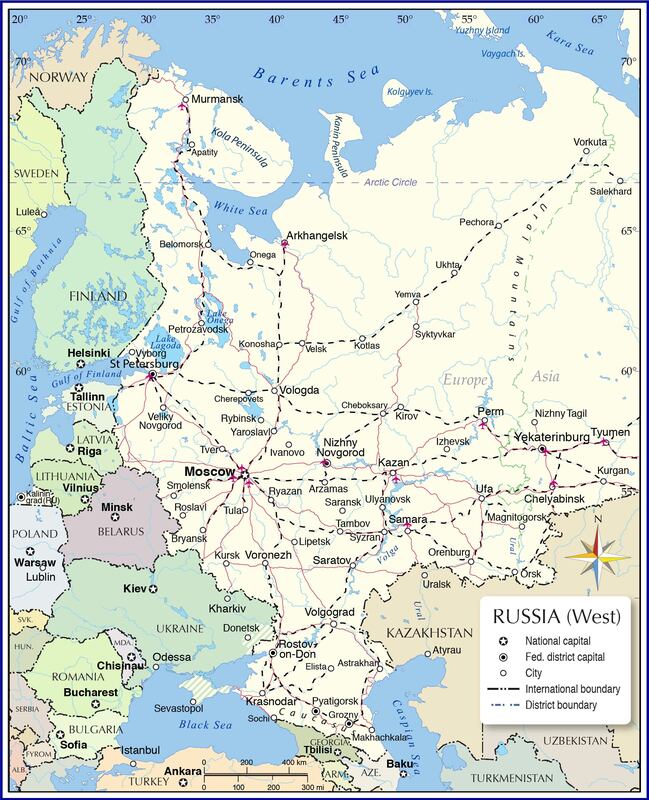 Russia is a transcontinental country, a state which is situated on more than one continent. Russia spans the northern part of the Eurasian continent, 77% of Russia's area is in Asia, the western 23% of the country is located in Europe, European Russia occupies almost 40% of Europe's total area. By convention, the line of demarcation between Western Asia and the European part of the 'supercontinent' of Eurasia, is along the Ural Mountain range, the Ural River, the northern slopes of the Caucasus Mountains, and the Turkish Straits. European Russia (or Western Russia) is situated in Eastern Europe on the East European Plain, the eastern part of the Great European Plain, the largest mountain-free landform in Europe, although a number of hills and highlands are interspersed within. The country is bordered to the north by the White Sea, the Barents Sea, and the Kara Sea, all arms and bays of the Arctic Ocean. In the west, Russia is bordered by Norway, Finland, and a small part of the Baltic Sea (at the Gulf of Finland). It borders the Baltic states of Estonia, Latvia, and Lithuania (at Kaliningrad) in the west; in the southwest, it is bordered by Belarus and Ukraine; there is also a border with Poland (at Kaliningrad Oblast). Furthermore it borders Georgia, Azerbaijan, and Kazakhstan. Western Russia has shorelines also at the Black Sea and the Caspian Sea in the southwest. The map shows European Russia and surrounding countries with international borders, the national capital Moscow, district capitals, major cities, main roads, railroads, and major airports. Map of Western Russia with administrative divisions. There are five federal districts in the European part of Russia: the Central Federal District with Moscow as its administrative center, the Northwestern Federal District, where St Petersburg is the administrative hub. In south there are the Southern Federal District with Rostov-on-Don as the administrative center, and the North Caucasian Federal District, created in 2010, with Pyatigorsk as its administrative center. In south east of European Russia is the Volga Federal District, Nizhny Novgorod (formerly known as Gorky) is the administrative center. The European part of Russia covers an area of 3,960,000 km², making it somewhat larger than India, or about half the size of the Contiguous United States. 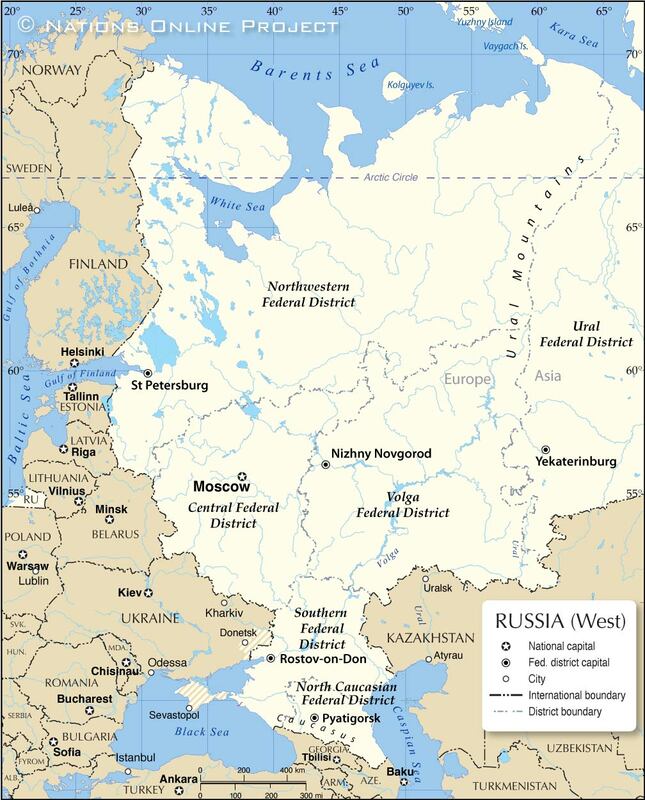 There are five Federal Districts in Western Russia. Situated in the west is the Central Federal District with Moscow as its administrative core. The district is bordered in the east by the Volga Federal District (predominantly in Europe) with its capital Nizhny Novgorod. the district occupies an area of 1,687,000 km²; this is about three times the size of France. Its administrative center is St. Petersburg. In the southwest, between Ukraine and Kazakhstan lies the Southern Federal District, bounded in the south on one side by the Black Sea on the other side by the Caspian Sea; its administrative capital is Rostov-on-Don. The North Caucasian Federal District borders Georgia and Azerbaijan in the south, and is bounded by the Caspian Sea in the east; its administrative center is Pyatigorsk. The northern portion of Russia lies within the Arctic Circle. The region includes the Kola Peninsula, parts of the Arkhangelsk Oblast, and the Komi Republic, as well as the Nenets Autonomous Okrug, home to the Nenets people. The landscape is dominated by Tundra, the treeless marshy steppe of the north. Southward of the Arctic Circle, above 60 degrees north latitude, the landscape is dominated by Taiga, the swampy coniferous forest of high northern latitudes with a mix of spruces, larches, pines and birch trees in north giving way southward to broad-leaved trees. 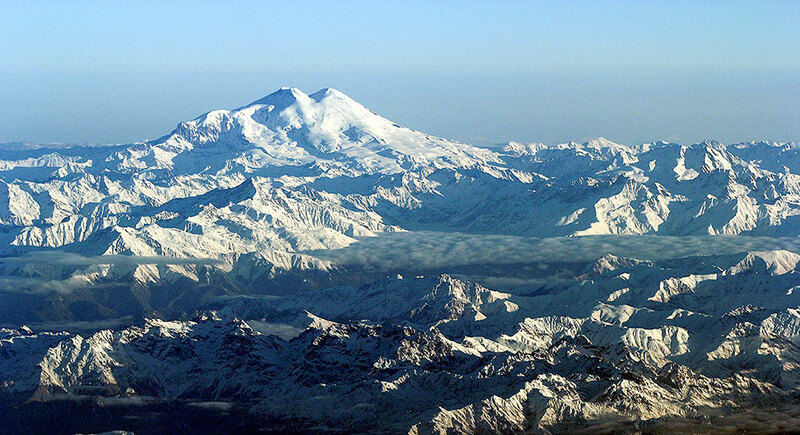 Mount Elbrus viewed from the south in Russia, it is the highest peak in the Caucasus mountain range, and Europe's highest mountain at 5,642 m (18,510 ft). The center of the East European Plain is covered by temperate broadleaf and mixed forests, the mostly flat plain is here and there disrupted by a number of hills and highlands, known as the Smolensk-Moscow Upland, the Central Russian Upland, the Volga Hills, and the Northern Hills. Since modern times, the plain is extensively developed for agriculture. The primary grains are wheat, barley and rye, and 'industrial' crops such as sunflower seeds, sugar beets, and potatoes. To the north of the Black Sea and the Caspian Sea is the region of the wooded, fertile Western Steppe (Pontic–Caspian Steppe), a portion of the Eurasian Steppe (East European forest steppe), a broad band of treeless, grassy plains, a region with savannas, and shrublands, giving way to semidesert along the northern shore of the Caspian Sea. The steppe begins near the mouth of the Danube River and extends northeast almost to Kazan and then southeast to the southern tip of the Ural Mountains. 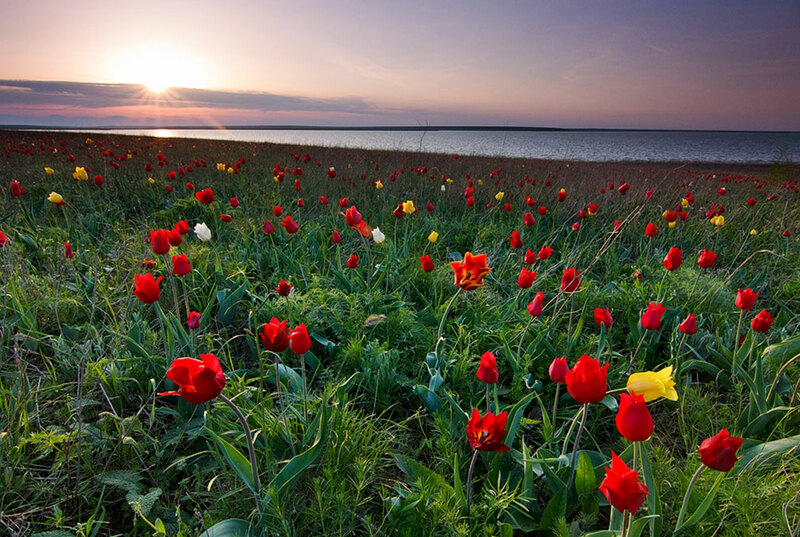 Tulip island, a protected area of Russia in Iki-Burulsky District in the Republic of Kalmykia. Tulipa suaveolens is one of the most typical spring flowers of the Eurasian steppe. The Ural Mountain range, the natural boundary between Europe and Asia, extends about 2,100 km (1,300 mi) south from the Arctic Ocean to the northern border of Kazakhstan. Its highest peak is Mount Narodnaya (1,895 m (6,217 ft)). 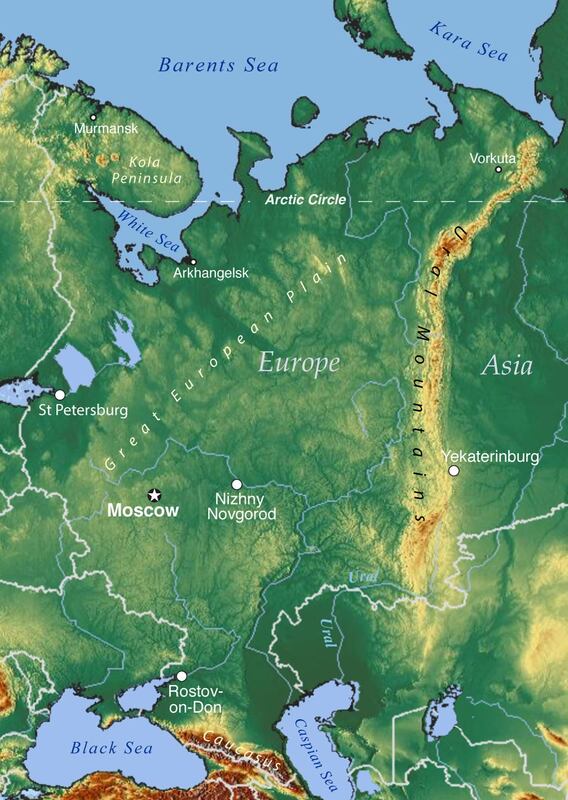 Geomorphic processes shaped Western Russia's mostly flat landscape during the Pleistocene Epoch (i.e., about 2,600,000 to 11,700 years ago, commonly known as the Ice Age), a period of repeated glaciations. Continental sized ice sheets covered most of Northern Europe, their movements scoured and abraded the plain's surface, eroded mountains to their bases and rendered the whole landscape flat. After the last glacial period, the melting ice left behind a lot of water, European Russia has many freshwater lakes, especially in the northwest and on the Kola Peninsula, almost all of them were created by glacial erosion. Western Russia's largest lakes are Lake Ladoga, the largest lake in Europe, and Lake Onega, Europe's second largest lake. The Rybinsk Reservoir or Rybinsk Sea is a human-made reservoir and the northernmost point of the Volga river. Other major lakes are Lake Peipus (shared with Estonia), Lake Beloye, Lake Vygozero, Lake Kovdozero, and Lake Segozero. European Russia has a population of 110 million people (in 2017), making it the most populous country in Europe. About 77% of Russia's total population lives west of the Urals. Therefore, almost all of Russia's largest cities are in the western part of the country. All these cities are significant social, political, economic, industrial, and cultural centers. 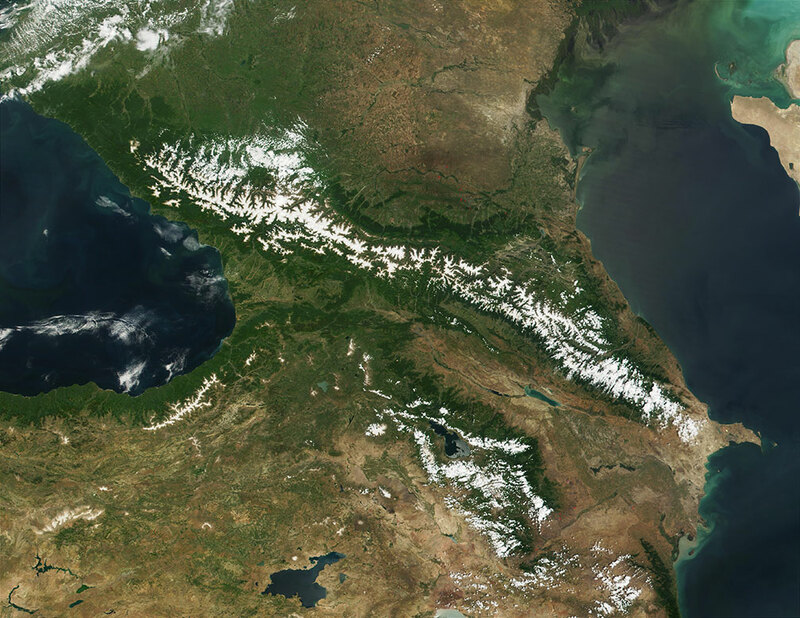 Satellite image of the Caucasus Mountains, the mountain range is situated between the Black Sea (left)and the Caspian Sea on Russia's border with Georgia and Azerbaijan, south of Russia's North Caucasian Federal District. The most populous city in Russia is Moscow (pop. 12,2 million), the second-largest city is Saint Petersburg (pop. 5.5 million), a major seaport and former capital of imperial Russia (until the Russian Revolution in 1918). Other major cities with more than one million people are Nizhny Novgorod, formerly, until 1990 it was known as Gorky, an important economic hub and a major center of river tourism in Russia. Kazan is a port on the River Volga; it is also the capital and largest city of the Republic of Tatarstan. Samara, known until 1991 as Kuybyshev, is a port and an industrial city at the Samara Bend of the Volga river opposite the wooded Zhiguli Mountains. It is the capital of the Oblast of the same name. Rostov-on-Don is a port city at the Volga-Don Shipping Canal, is one of the largest cities in the European part of the Russian Federation. The capital of the Rostov Oblast is known as the "Gateway to the Caucasus." Ufa is the capital of the Republic of Bashkortostan; the city lies at the confluence of the Ufa and the Belaya rivers, about 100 kilometers west of the Ural mountains. Perm, the easternmost metropolis in Europe is an industrial city and a transportation hub. The city is situated in the Ural foothills on the Kama river, a tributary of the Volga. Volgograd was formerly known as Stalingrad, an industrial city and the administrative and economic center of Volgograd Oblast. The city is on the lower Volga. The cities of Chelyabinsk, the administrative center of Chelyabinsk Oblast, and Yekaterinburg, the capital of the Ural Federal District, are technically in Asia, but they belong to the European Russian economic zone. Murmansk is a port city located on Kola peninsula; with a population of more than 300,000 people, it is by far the largest city north of the Arctic Circle. Murmansk and Severomorsk, 20 km to the north, are important bases for Russia's Northern Fleet. Vorkuta is a coal-mining town with a population of about 70,000 people; it is the easternmost city in Europe. Apatity, Arkhangelsk, Arzamas, Astrakhan, Belomorsk, Bryansk, Cheboksary, Chelyabinsk, Cherepovets, Elista, Grozny, Ivanovo, Izhevsk, Kaliningrad, Kazan, Kirov, Konosha, Kotlas, Krasnodar, Kurgan, Kursk, Lipetsk, Magnitogorsk, Makhachkala, Moscow, Murmansk, Nizhny Novgorod, Nizhny Tagil, Onega, Orenburg, Orsk, Pechora, Perm, Petrozavodsk, Pyatigorsk, Roslavl, Rostov-on-Don, Ryazan, Rybinsk, Salekhard, Samara, Saransk, Saratov, Smolensk, Sochi, St Petersburg, Syktyvkar, Syzran, Tambov, Tula, Tver, Tyumen, Ufa, Ukhta, Ulyanovsk, Veliky Novgorod, Velsk, Volgograd, Vologda, Vorkuta, Voronezh, Vyborg, Yaroslavl, Yekaterinburg (Ekaterinburg), and Yemva.